Q: Paul, if we could start with you and deal with the here and now, Max Verstappen had a crash in that FP1 session. What can you tell us about the state of your car? Paul MONAGHAN: It's not survived unscathed, so we've got a front-left corner to change, we're underway with that. There's a little bit of bodywork repair to do on the left-hand side, change the floor, rear wing, that sort of thing. It's time-consuming but recoverable. So, with a following wind we'll get him out in P2. Q: Have you spoken to Max, do you know what caused the accident? Monaghan: It's difficult to know what caused it to swap ends under braking. Nothing's broken, nothing's gone wrong. I think he's braked pretty much in the same point so we're having a hunt through to see what may lie underneath that but I don't think there's anything sinister in it and he'll be out in P2 – and he'll be quick, don't worry. Q: Max's problems aside, the team has hit the ground running this year with RB14, fastest lap in two of the opening three races and, of course, that terrific victory last time out in China. Just how much can you achieve with that car this year? Monaghan: We ought to have that chat in Abu Dhabi really, and then we can put facts to it. It really comes down to what the gentleman to my left does and what other competitors do. We will develop at the best pace we can, we'll try to operate the car in the most competitive way we can and, actually, we're judged by our opposition, aren't we? We'll do what's in our control, get to the end of the year, be as quick as we can and if we're in the hunt, we're in the hung. Q: And what can you tell us about updates? Have you got stuff coming in Barcelona? Is there a big chassis upgrade there? Monaghan: I don't think there's a race where we don't have any updates. The magnitude of the updates varies race to race, as I'm sure it does for other people as well. There might be a few more changes in Spain – you'll have to wait and see. Q: Mario, if we could come to you now. You gapped the tyre compounds in China, leap-frogging the supersoft tyre. How successful was that approach? What feedback have you had from the teams? Mario ISOLA: I feel it was successful but obviously, the Safety Car changed a little bit the situation. So, we had a two-stop race but mainly due to the Safety Car – but it's interesting to see that the top teams – Ferrari, Mercedes – decided to qualify in Q2 with a soft compound in order to have this opportunity to start the race with a different tyre. So, we created a bit of difference in strategies also at the beginning of the race. It was the same in Bahrain where all the three compounds were suitable for the race and all the teams used different combinations, different strategies. This is the target we can achieve. Q: The desire pre-season was for two pitstops in each grand prix – but one stop has been possible at all of the races. What have you got to do to achieve those two stops? Isola: If I look at the target that we have, it's to have different strategies with different numbers of pitstops possible. Obviously if a team is able to control degradation, they always try to maximise the one-stop strategy – or to use the one-stop strategy. So, what we do when we select the compounds is to try to have a two-stop strategy that is the quickest – but obviously, we have a three-stop and a one-stop that is close to the two-stop but with a delta lap time, a total race time, that is sometimes a few seconds. So, depending on team choice and how they manage the pace, they can change and go towards the one-stop strategy that is always, let's say, less risky, because you don't go back in traffic – and we know how difficult sometimes it is to overtake another car – you don't take the risk to have another pitstop, so to make a mistake in that pitstop, and so on. That's why when you have strategies that are all very close, all the teams are trying to go in the one-stop direction. But, if we have different cars with different strategies, I think we had a couple of good races with a good show. So, we should continue in this direction. Q: You announced yesterday your compound choices up to and including the Austrian Grand Prix. Is there a little bit of evidence of a more aggressive compound choice from Pirelli going forwards? Isola: In general, this year we are more aggressive with at least one step. Here in Baku we are two steps softer than last year. This is the direction. To make the right decisions, we need to collect more data. We started the season, for example, the nomination for Baku was 15 weeks ago and had available only the numbers coming from the Abu Dhabi test, end of last season, so we are collecting new numbers, we put the new numbers in our system to generate strategies, and, if it is possible, – we don't just consider the numbers but also other elements – but if it is possible, we want to move on the softer side in order to have more interesting races. Q: James, Mercedes are leading the Constructors' Championship but this is the first time in the hybrid era that you've got three races without a victory – so what is the mood in the camp at the moment? James ALLISON: Well, hungry to get that first victory, obviously! And hungry to follow it up with more. We'd had our chances. We've squandered some of them and we would like, dearly, to have a race weekend where we do everything right and get a race win. Q: Is there any evidence that Lewis is struggling with this car more than Valtteri? Allison: No, I wouldn't say so. No, I don't think so. If you look at pre-season, Melbourne and Bahrain as well where he was hampered by a gearbox penalty, but he's been going well. Q: How do you assess the pecking order so far this year? Allison: It's tough to do, honestly. We were clearly quickest in Melbourne; it was really close between us and Ferrari in Bahrain and all three teams had a fair shout in China. Probably Ferrari had the edge overall but we looked like we were going to rob them with a bit of a burglary job in an undercut and then Paul had us over at the Safety Car. So it's terribly tight – which makes for a great spectacle, gives us a real challenge and is anxiety-inducing and exhilarating in equal measure for us and the teams. Q: (Scott Mitchell – Autosport) A question for both Paul and James. From next season we will have an increase in the fuel limit in Formula 1. I just wanted to get your thoughts on the potential this has to change the competitive order. Do you think there is enough of a difference in the fuel efficiency of the different engine manufacturers to make a bit of a difference? Monaghan: Honestly, I can't answer your question, because I can't tell you how fuel efficient the Ferrari or the Mercedes is, not from their measured sheets, we can make an estimate. Will it change the competitive order, I don't believe it will, no. What you'll find is… let's take the ideal scenario, by which the Red Bull is the quickest car next year. We'll get first and second on the grid, other people will be behind us and then in the race you'll have 110kg of fuel to burn. If we all need to lift off a certain amount at the beginning of the race then you're not going to change the order very much. What will happen is, let's say if our engine is less fuel efficient, then we won't be lifting off but we will go off the line slightly heavier. If anything, what we will avoid is all the people lifting off the straights to try and save the fuel, which I think will be better for the overall spectacle. Q: James, anything to add? Allison: No, very similar. I don't think it will change the order one iota, but people don't really like the lift-and-coast spectacle and it will reduce that somewhat at the very heavily fuel-limited tracks. However, not all the tracks are heavily fuel-limited and there it will make no difference at all. Q: (Dieter Rencken) To Paul and James: after the Ferrari report of their incident in Bahrain was shared with the teams, have you in way changed your pit stop procedures and operations? Allison: No, is the answer. Q: (Ben Edwards – Channel 4) To Paul and James: just a quick question about the rule change on the ability to fit mirrors on the Halo. I just wondered if teams had looked into that at all yet and if it's something we will see in the future? Monaghan: Now there is some clarity, I guess we know that we can now put mirrors on Halos, so if someone wants to go down that route and try to fulfill the other requirements in the TD, which are not trivial to observe, then yes, we will see it in a few races' time. Whether or not you actually can make it work I think is more tricky. Allison: Yeah, it's not a rule change, it's a clarification of the existing rules and it is tough. It is tough to attach to attach a mirror and not make it wobble around and satisfy all the criteria of the TD that clarifies what you can and can't do. Q: (Dieter Rencken) Again to the two technical delegates on the stage. If we look at the post-2020 regulations, where they're talking about doing away with some of the heat energy recovery systems and increasing rev limits and fuel flow and whatever. Could we see a return to pit stops with refueling or are we just going to go to the line with cars weighing 50 or 60 kilos more than they do at the moment? Allison: Well, there would need to be a change that would allow refueling back into the sport for that to happen. If refueling was allowed it's quicker to do a race that way, but I'm not sure that's part of the package of things that is currently on offer for 2021. Does that answer your question? Q: (Dieter Rencken) Then the weight is going to go up drastically? Allison: Well, the weight will be whatever the fuel allowance is, won't it? Monaghan: It's difficult to answer your question Dieter, because we haven't been presented with a set of technical regulation proposals for 2021. You could up the fuel flow rate to the engine and not give us any more fuel flow for the race, in which case your off-the-line weight doesn't actually change but will never attain the qualifying fuel flow rate. So, as James had said, we don't have refueling at the moment, we could, but if that's not in then you are correct in that the potential is for the car weight to go up off the line. Q: Would you like to see a return of refueling? Monaghan: No idea, actually. We looked at it a while ago and from memory of the simulation work done within Red Bull, I suspect all the teams' strategies would converge on the same thing, because you no longer have an ever-decreasing car weight, you reset every time. You'll pick the quickest way to do the race, the pit stops get a little bit longer, and if we all sit there doing the same thing then what we have done is to put a big valve in the side of the car. Allison: It's to be assessed carefully but the refueling strategies are more predictable and allow less variation in the race and less surprise in the race than non-refuelling strategies, because once you put a chunk of fuel in your car, you have to stop on the lap where you run out, or a lap or two before and everyone knows when that is going and it just stops the surprise undercut or the chance overcut that comes with the current regs. Q: (Scott Mitchell – Autosport) James, last season Mercedes faced a sustained challenger from Ferrari, which mean that you were having to react to having an extra car or two in the competitive picture from the beginning. This year it looks like Red Bull is in the mix too. Apart from simply adding two more cars to the equation, how much more difficult has that made Mercedes' life and how have you responded to that challenge. Allison: Well, time will how we respond to it. Hopefully we respond to it by being nicely competitive and at the front of the pack. But that will be very difficult, because these are two very strong competitors. Having six cars that can have a claim on the top step of the podium makes it a headache for all six that are doing that. All we can do is try to make our car as quick as it can be, with the developments we bring in the factory and then have a weekend, every time we come out here, where we make no mistakes, and hopefully other blink, and others maybe don't develop quite so strongly. But these are three very strong teams, so it makes for an exciting prospect. Q: (Tony Dodgins – Channel 4) Question for Mario: have you had any feedback on the ultrasoft performance from the first session, because we heard Seb's radio message where he said these tyres are toast and we know that Kimi's only got one set of supers? Has there been any feedback? Isola: I think we have a lot of track evolution, which is typical of street circuits like this one. The circuit was with a lot of dust and so we need to wait for FP2 to understand the real performance of the three compounds. It's not a surprise that the level of grip in general is very low so we will see. There is also the wind that sometimes affects the performance or changes the braking points and so on, so let's wait and see what happens in FP2. Q: (Julien Billiotte – AutoHebdo) Mario, several teams including Mercedes have found it harder to find the sweet spot with the 2018 Pirelli tyres. Have you been surprised by that? And to Paul and James, how has been the tyres' measurement from your own perspective? Isola: No, I'm not surprised because when we have a working range, we give an interval of temperature where the tyres are working but there is always a peak and when you have three teams with the cars so close, they are looking for any hundredth of a second to find the best performance in the tyre. That means that it's very difficult to find the sweet spot, even if you have a working range that is wider. To develop new compounds, especially the softer compounds we started from the soft from last year - that was the one with the wider working range, so the approach was this one, trying to increase the working range but as I said, it's not flat performance from eighty to 110 degrees, you always have a peak and if a car is able to stay in that position, they have a performance advantage. Allison: Well, we have generally got it right in the race, so we've generally had the tyre working very nicely in the races, pre-season and in these opening rounds but we have not always got it right in qualifying, to make the tyre wake up and play on the single lap and that's our job to do. It's eminently do-able and it's going to be fun when we get it right every time. Monaghan: To answer your question, I don't think it's any more difficult than it's been the past few years. Once you've identified what you want to try and do with it, if the drivers and teams get it right then we can find it. I think it's an evolution of what we've learned for the last few years. Q: (Dieter Rencken) To the two technical delegates: there's been this talk about the $150m budget cap which applies predominantly to technical issues and race operation issues because marketing etc are excluded. James, specifically your team, which is one of the biggest budgets on the grid and also to Paul, is it actually realistic to expect a team to cut back to $150m in two years' time? Allison: Well, I think the answer to that is probably a little above my pay grade. You want to probably pitch that towards Toto but what I would know is that this is the opening point of what will be a fair amount of discussion between the teams and Liberty over the coming weeks and months, and I'm sure that a position will eventually be agreed that works for all parties. Monaghan: I would agree with what James has said. We will see where the discussion goes and we'll set the team up to suit the rules as they evolve and become clearer. Q: (Scott Mitchell – Autosport) Another question for James and Paul: over the last few months, there's been plenty of discussion over FIA personnel leaving and joining different teams on the grid; in fact one of those is starting his first Grand Prix weekend here with Renault. 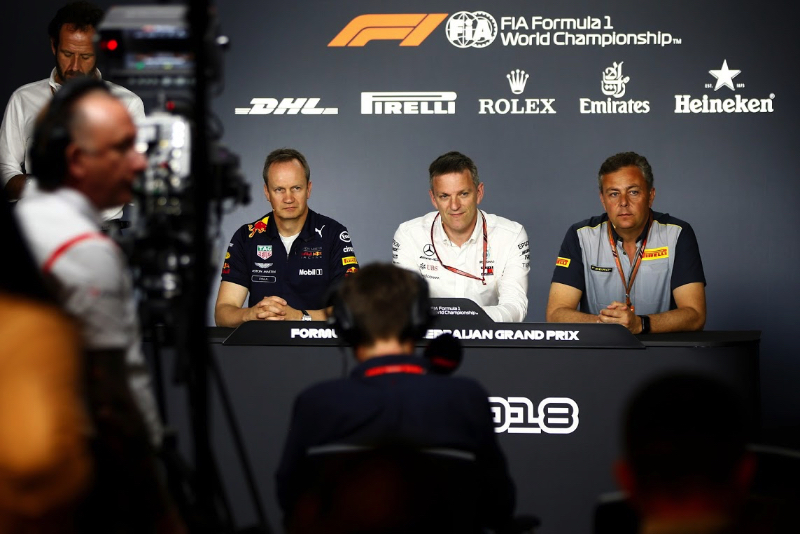 One of the suggestions has been that that could lead to a bit of mistrust from teams about what they can and can't present to the FIA for fear of it eventually being taken elsewhere. Has there been any evidence of that so far and do you think that is a serious issue going forward? Monaghan: It is a serious issue. It has been discussed in other forums, shall we say. I believe that there is now a non-disclosure agreement between the FIA, F1 and all the teams, so our data is at least protected. People move between the teams, so knowledge is transferred in that respect. I suppose someone in a governing body with access to all the teams' areas could be a prize catch and I believe that there are changes afoot to limit how… what a gardening period and after that it's a process that we are all at risk to, I guess. Allison: I think your question was whether there had been any evidence of that? No, the FIA have always treated our data with unimpeachable fairness and discretion and there's no evidence at all that there's been anything other than that, even with a couple of people leaving so no.